Family recipes and time-honored cuisine are the foundation of this Hoffman Estates hot-spot whose owner has been part of many big-name restaurants throughout Chicagoland. Di Benedetto Trattoria owner and chef Vittorio Di Benedetto shares the success of his Hoffman Estates restaurant with his staff. L-R: Server Patty Braun, Di Benedetto, servers Ashley Brechel and German Perez. Vittorio Di Benedetto came to America in 1984 from his native Rome, not knowing a word of English but having a love of food imprinted in his DNA. Born into a family where the love of food is passed down from one generation to the next, Di Benedetto hasn’t lost sight of the highly regarded pastas, wines, and seafood and veal dishes for which his homeland is known. 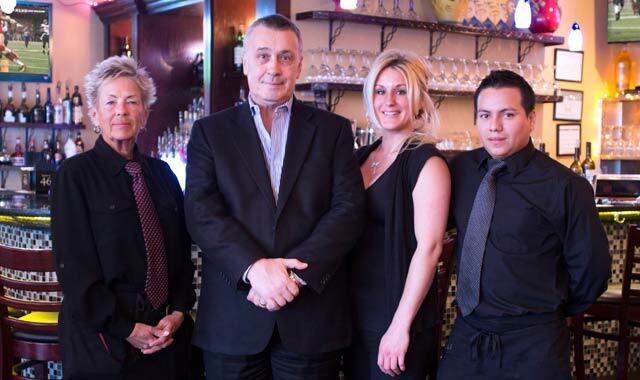 Three decades after settling here, Di Benedetto has built an illustrious career as a restaurateur, having opened Phil Stefani’s Tavern on Rush in Chicago, Portofino in Vernon Hills, Vittorio de Roma in Palatine and Ti Amo in Hoffman Estates, among others. His latest creation, Di Benedetto Trattoria, 1766 W. Algonquin Road, Hoffman Estates, is much more personal. “When the opportunity came along in early 2012, I jumped at the chance to open my own place,” says the 57-year-old chef, who owns the business with wife Katherine. Di Benedetto focuses on classic Italian fare. Signature dishes include pork osso bucco, linguine pescatora (pasta with clams, mussels, shrimp and calamari), and Ziti Caterina (incorporating the chef’s homemade Bolognese sauce). Entrees average in price from $13 to $19, though one of the restaurant’s most popular sellers, U10 East Coast Scallops, goes for $33. Six or seven specials are featured daily, and every two or three weeks, the kitchen turns out hand-rolled eight-finger cavatelli: pasta cut into bite-sized pieces, flattened and rolled by thumb into small shells that resemble a hot dog bun. “We don’t change the menu a lot, and some ingredients, such as Prosciutto di Parma, always come from the old country,” says Di Benedetto. But the chef isn’t shy about trying new things. He recently discovered locally grown sweet Melrose peppers, which he now serves with a specialty red sauce. The restaurant will also accommodate customer requests for off-menu dishes, provided the necessary ingredients are on hand. Some desserts, like tiramisu, panna cotta and applet tart, are made in-house. And the full bar is well-stocked. Domestic and Italian wines, and a few from South America, are represented, and Di Benedetto says rotating the stock enables him to offer premium house wine for $8 a glass. The inviting space has gleaming hardwood flooring and a black color scheme. It seats about 100, including 45 in a small private room. A partition separates the main dining room from the bar area, and black-and-white photos of Italian celebrities adorn some of the walls. Reservations are recommended, especially on weekends. The venue frequently has bookings for private-party lunches on Saturdays and Sundays. Live music and dancing are offered Wednesday, Friday and Saturday nights. DiBenedetto Trattoria serves dinner Tues.-Sat. from 5-10 p.m. and Sun. from 5-9 p.m. Lunch is served Tues.-Fri. from 11:30 a.m.-2 p.m. This entry was posted on Wednesday, November 26th, 2014 at 12:00 pm	and is filed under Dining Guide, Top Posts. You can follow any responses to this entry through the RSS 2.0 feed. Both comments and pings are currently closed.